Concrete mixing station weighing system how to be a problem, calibration weighing accuracy, our factory have sand aggregate weighing weighing system allowed error range + / – 2%, water permissible error range of plus or minus 2%, cement weighing allowed error range + / – 2% plus or minus 2%, admixture, fly ash weighing allowed error range weighing allowed error range + / – 1%, let’s take, for example, the sand and gravel aggregate said school known as example. Usually sand aggregate in concrete mixing station batching machine has four, two stones, two sand storehouse, before the school said first prepare a fixed weight of 200 kg of objects, the first school was carried out on the stones a storehouse, according to the 200 catties of objects on the stone warehouse weighing hopper, and then let the control room operator to manually weighing of stones in a warehouse, after reaching the allowed error range to stop, if a school called the results do not conform to the requirements, can be the school said many times, until the permissible error range. 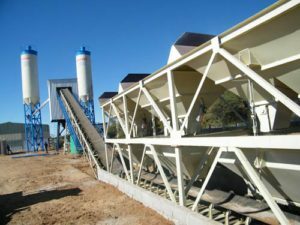 The operation methods of gravel bin, sand bin and sand bin are carried out in the same order.